Moong dal used to be my mom’s go to dal for a quick meal. It can be prepared very quickly in just 15 minutes. It is also a great source of proteins for vegetarians. For all the fitness pals, this lentil is very low in calories. It is also extremely light and healthy. That is the reason this is a preferred lentil when someone is sick and recovering, as it is very easy to digest. 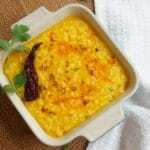 This dal is also considered a great starter food for babies. 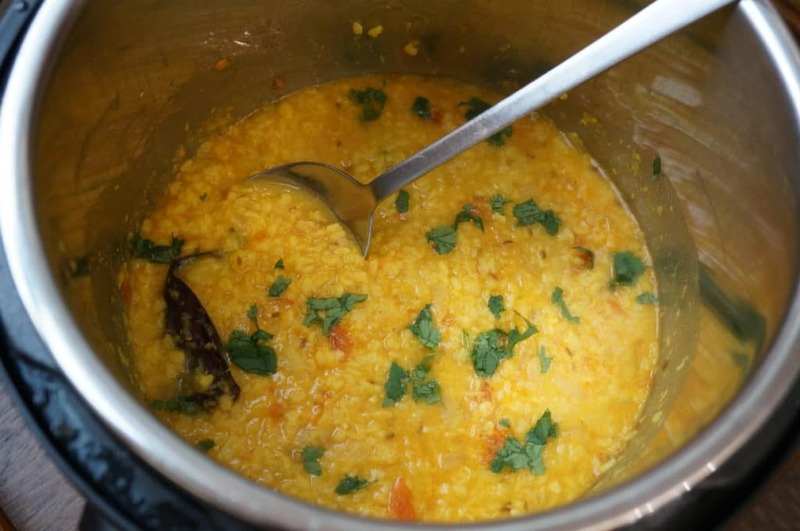 Moong dal is also used to make Khichdi, which is a great comfort food for Indians. 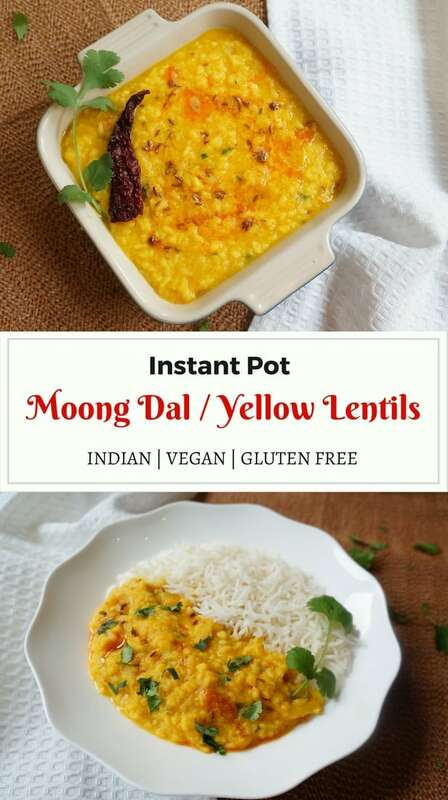 How to cook Moong Dal in Instant Pot? 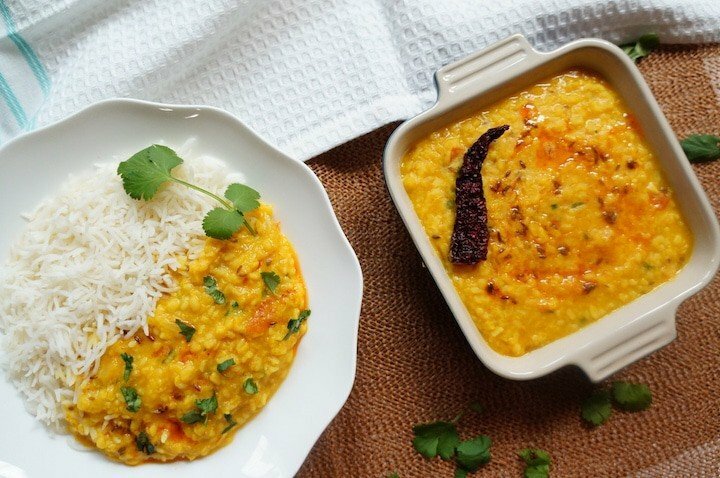 One thing important to note is that these split yellow lentils cook very quickly, so you want to be careful that it does not get too mushy. I prefer the grainy consistency where you can really taste the dal. There are 2 ways to make any lentils. Traditionally lentils were first boiled separately in water and the tadka (tempering) prepared separately and mixed into the boiled lentils. The second way is to make the tadka and then add the lentils and pressure cook along with the tadka. I prefer the latter as it is a simpler one-pot recipe. Hence I will show the method latter method in this recipe. The ingredients needed for this recipe are the very basic onions, tomatoes and garlic. Some people even skip the onions and tomatoes in this lentils, and temper just with cumin and garlic. Start with heating ghee/oil in the instant pot. Then add cumin seeds, asafoetida, onions and garlic. Saute for 2-3 minutes until the onions are lightly cooked. Then add chopped tomatoes and spices. Add rinsed lentils and water. No need to soak the lentils for this recipe. Pressure Cook for 4 minutes and then release the pressure 5 minutes after the beep. Garnish with cilantro and additional garam masala if you like a spice kick. You can enjoy this as a soup or with basmati rice or roti. In the picture below, I added a little ghee tempered with cumin and red chili powder, which is completely optional. It just helps to make the dal look gorgeous, and ghee always enhances the taste. Looking for more easy Instant Pot Recipes? Here are 29 Best Instant Pot Vegetarian Recipes for you to try! 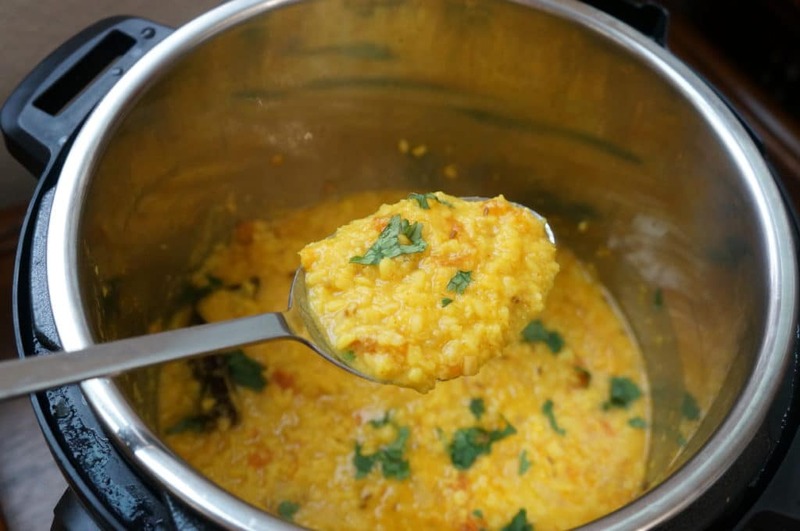 Moong Dal Tadka or Split Yellow Lentils Soup made in instant pot. 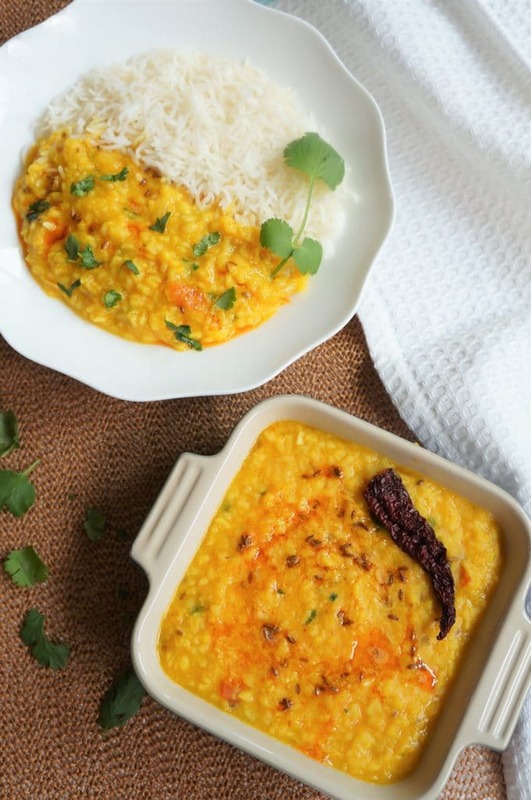 A simple yet flavorful yellow dal tempered with cumin, garlic and spices. This is a mild everyday lentil enjoyed with rice. Start the instant pot in sauté mode and heat oil in it. Add cumin seeds and asafoetida. Once the cumin seeds start to change color, add the onions, garlic and saute for 2 minutes. Add tomatoes, turmeric, red chili powder and salt. Stir and saute for 2 minutes. Add the washed dal and water. Stir it all up. Pressure Cancel and close the lid with vent in sealing position. Change the instant pot setting to manual or pressure cook mode at high pressure for for 4 mins. After the instant pot beeps, let the pressure release naturally for 5 minutes, then release the pressure manually (5 minute NPR). Garnish with cilantro and stir. Optionally, sprinkle the juice of half a lemon and some garam masala. Moong Dal is ready to be served. hi when i boil the daal in instapot i get a lot of froth floating on the top ! any way to get rid of the froth. i feel bad to mix it with the daal. Hi Santosh – I believe the foam can reduce with washing the lentils well. Also, based on what I have read it is not harmful and will mix when stirred. You can also scrape it off with a ladle if you like. I followed this step by step. This was my first Instant Pot cook, and it came out great. Thank you so much. My 1 year son enjoyed it as well. Hi Chirag – So glad to hear you and your little one enjoyed the dal. Thank you for sharing back your review!